Swiss designer Reto Togni has developed a cling-film-like temporary window to make damaged houses in conflict zones habitable. Togni worked with his friend, humanitarian worker Wendelin Federer, to develop Instant Windows, which is going on display at Milan design week as part of the Swiss arts council Pro Helvetia's Design Switzerland exhibition. Instant Windows are unrolled from a tube in the manner of cling film. 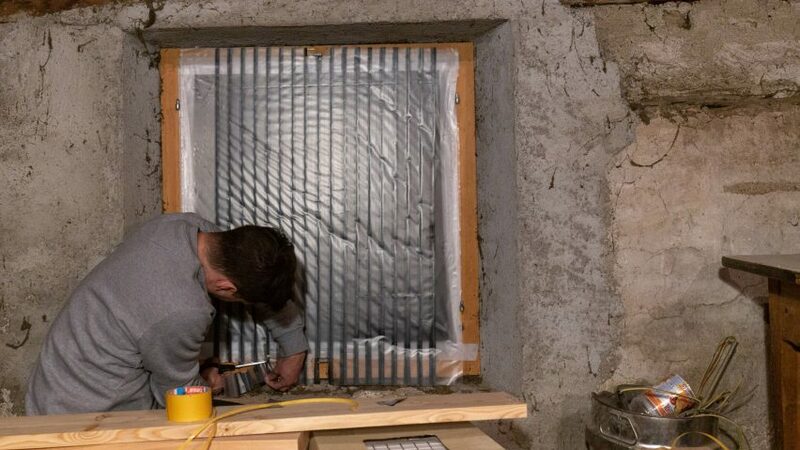 They are cheap to produce and easy to install, and offer a level of insulation similar to a single-pane glass window. The insulation is created through the layering of two sheets of plastic, with an air pocket maintained by latches that cross the sheeting like shutters. The latches fold flat for storage in the roll, but lock open at a 90-degree angle during installation to separate the two layers of plastic. A zip-lock mechanism fixes the latches into place. Adhesive tape attaches the window to an empty frame and seals the air pocket. The only other tool required for installation is a pair of scissors — users simply snip off excess material from the roll as required. Togni and Federer believe in some cases the product could be the difference between people being able to stay in their homes or having to leave and seek refuge elsewhere. "Housing loses are an important driver of the mass migration of displaced persons from affected areas," they told Dezeen. "Depending on outside temperatures and climate, something as simple as a damaged window – for example from the shockwave resulting from the use of explosive weapons in the vicinity – can leave the housing uninhabitable and push residents over the edge into displacement. For many, becoming displaced is a life-long sentence." Togni and Federer say Instant Windows are more insulating than traditional temporary repair solutions, such as covering the empty frame with rugs, cardboard or wood. They also have the added advantage of being transparent, so light can still enter the room. Togni told Dezeen that designing for a conflict environment meant working with "tough" constraints. The product had to be durable, affordable, compact to ship and to work universally without tools. "The most challenging bit was designing a manufacturing process for a simple, endless material alongside the product itself for which easy installation without tools was important," he said. "In that sense, creating a material that would be manufactured, sold and used 'by the metre' is a core feature." The nature of the humanitarian sector can also make roll-out a slow process. While Togni finished the prototype in 2016 and the product has attracted interest from NGOs, they still have not had the opportunity to field test it. They are looking for partners now and say testing at a temporary housing project in Jordan is looking "likely". "It is — and for partially good reasons — very difficult to sell a product to NGOs or governmental organisations for response to humanitarian crisis," Togni and Federer told Dezeen. "We are hoping to overcome these hurdles as many who have worked in crisis areas have encouraged us to implement the Instant Windows as they are addressing a huge problem." Several designers have been prompted to create products for conflict zones and refugee camps as a result of the recent refugee crisis, which has seen more people forced to flee their homes than at any time since the second world war. IKEA's flat-pack Better Shelter took the Design of the Year award in 2016, while Anna Meddaugh produced a safety-focused Night Loo and Stephanie Chaltiel used drones to construct her Mud Shell emergency homes. Instant Windows will be exhibited at Design Switzerland at Corso Magenta 24, Milan 20121 from 9 to 14 April.